Who could want a more romantic love story than a young Indian prince, visiting the local bazaar, who sees and falls head-over-heels in love with a beautiful young woman hawking silk and glass beads? Immediately the prince goes to his father, proclaims his love for the girl, and swears he will marry her. So begins the love story of Prince Khurram, later called Shah Jahan, fifth Mughal emperor of India, and the Muslim Persian Princess Arjumand Banu Begum, later called Mumtaz Mahal. The year was 1607, and the prince was 15, the Princess 14. Like most stories and history set in this era, everyone has many names and marriage is primarily for political reasons. The historical events are complex and convoluted, and a man has many wives, many relatives -- and many enemies. This love story involves real people whose lives are well documented historically. At the age of fifteen, he met and fell in love with Arjumand Banu Begum, later named Mumtaz Mahal, a Muslim Persian princess of fourteen. Arjumand was the daughter of a noble Persian family who had served the Mughal emperors for several generations. Her wealthy father, Abu’l-Hasan Asaf Khan, was Minister of Finance and then Chief Minister in the Mughal empire. She was also the niece of the Empress Nur-Jahan, who just happened to be the chief wife of the emperor, Prince Khurram’s father. Considering Arjumand’s background, it seemed unlikely to me the prince first saw her in the market selling glass beads. However he met her, when the young prince told his father he wanted to marry Arjumand, the emperor agreed, and they were betrothed in 1607. They had to wait five years before marrying on April 30, 1612. Other marriages for the prince had already been arranged. Whether or not his marriage to Arjumand was arranged by the Empress Nur-Jahan, as some sources indicate, it was truly a love-marriage. Shan Jahan was enthralled with Arjumand and gave her the title of Mumtaz Mahal (Exhalted One of the Palace, Chosen one of the Palace, or Jewel of the Palace, depending on the translation). But first Shan Jahan married Princess Kandahari Begum in 1609. After he and Mumtaz Mahal married, he took a third wife in 1617. According to the official court records, the first and third marriages were political alliances. The prince showed little interest in the other wives other than to fulfill his duty of siring a child with each. One source indicated he had eight wives in all. Another (https://www.wonders-of-the-world.net/Taj-Mahal/Shah-Jahan.php) indicates there were eleven marriages and that Mumtaz was the third wife, not the second. Nonetheless, the others are acknowledged as political alliances. If this were the end of the story, it is an H.E.A. But like most marriages, life continues on after the wedding, and the marriage comes to an end one way or another, even if it is “until death do us part”. Despite her many pregnancies, Mumtaz traveled with her husband on his military campaigns, of which there were many, even a rebellion against Shah Jahan’ s father. She was not only beautiful and educated, but intelligent and politically astute. When Shah Jahan became emperor in 1628, she wielded great power and was made responsible for the imperial seal which put her in a position to review official documents in final form. She was a great influence on the emperor and often intervened on behalf of the poor and destitute and provided pensions and donations to the daughters of poor scholars, theologians , and pious men. Shah Jahan promised Mumaz Mahal on her death bed that he would never remarry and would built her a mausoleum like no other in the world. And he was a man of his word. The beloved Empresses was buried in Burhanpur with the intention of moving her to the mausoleum Shah Jahan began planning while he was still in Burhanpur. The task of erecting the world's most beautiful monument in the memory of his beloved took 22 years and the labor of 22,000 workers and 100 elephants to construct. It was completed in 1643 but work continued on other phases for another ten years. The estimated cost was 32 million rupees, which, according to Wikipedia, in 2015 US dollars would be nearly $827 million. When I visited the Taj Mahal the tour guide told us the Shah Jahan nearly bankrupted the empire. As a consequence, his son imprisoned him in the Red Fort across the river until he died in 1666. Wikipedia and other sources tell the story a little differently. Apparently, in 1657 Shah Jahan fell ill. That set off a war of succession among his four sons, with Aurangzeb coming out on top. Shah Jahan recovered but his son put him under house arrest in Fort Agra in July 1658, and crowned himself emperor. Shah Jahan remained there, able to see the Taj Mahal across the river, until his death. Shah Jahan is considered to be one of the greatest Mughal emperors. Today is “Black Friday”, the day after Thanksgiving which we all know and love. The beginning of the Holiday shopping season. Actually, the term “Black Friday” is used in several contexts and dates back to the US financial crisis of 1869 which appears to be the first recorded use, and the term has been used for many events marking financial downturns since then. The designation came into more general use around 1975 and by the 1980s, merchants were objecting to the negative connotation. So, being the innovative business people we are, someone came up with the argument that this was the point in in the year when businesses (which traditionally operated at a loss or “in the red”) started making profits and operated “in the black.” Tah-dah! Now, merchants love it so much they are spreading it to all times of the year. Whoopee! Black Monday occurred on October 19, 1987, when the Dow Jones Industrial Average lost almost 22% in a single day. The event marked the beginning of a global stock market decline, making "Black Monday" one of the most notorious days in recent financial history. By the end of the month, most of the major exchanges had dropped more than 20%. "Black Tuesday" is the day marked as the great Wall Street Crash of 1929. A second Black Tuesday event was the Tasmanian fires in 1967. ​•February 6, 1851, a day of devastating bushfires in Victoria, Australia. •The Panic of 1873 when the US bank Jay Cooke & Company declared bankruptcy, triggering a series of bank failures. •October 14, 1943, when the Allies suffered large losses during bombing in the Second Raid on Scheweinfurt during World War II. On February 7, 2009, Victoria, Australia, was savaged with disastrous bushfires that became Australia’s most devastating. More than 170 people were killed, more than 400 injured and more than 7500 forced out of their homes. Bushfires also caused about $4.5 billion worth of damage to the state. The worst dust storm ever seen on the Great Plains hit Rolla, Oklahoma on Sunday, April 14, 1935. There are some “good” days out there, too. At least, days with different colors and some dedicated to some worthy endeavors. The day Green Monday (coined by eBay) is an online retail industry term defined by the business research organization comScore as the last Monday with at least ten days prior to Christmas. It also refers to a network of sustainable development practitioners in the UK, which meets on the first Monday of every month to discuss critical environmental issues such as climate change. The days of the week in Thai are named after ‘god’ planets and each are associated with a specific color. Thais believe wearing the color of the day brings good luck. In 2006, in order to commemorate the King’s 60 years on the throne and to show their respect and love for the King, the Thai people started to wear yellow shirts every Monday. Cyber Monday is the first Monday after Thanksgiving. It was christened by Shop.org in 2005. At that time, shoppers needed the faster internet speeds from work computers to shop online. Now, personal laptops and mobile devices are as fast as work computers. In 2017, it was the biggest shopping day of the year, replacing Black Friday in terms of billions spent. On Giving Tuesday, people around the globe show their “true blue colors” and take action by donating to the causes they care about. Many charities launch their campaigns on “Giving Tuesday”, all associated to the color blue. Masih Alinejad is an Iranian journalist who is an advocate and activist for religious freedom and women’s rights. Her “White Wednesdays” movement is a relatively new initiative, starting after the May 2017 reelection of Rouhani as women took to the streets waving white hijabs like flags in protest of the compulsory hijab laws. Purple Wednesday is the Global Day of Epilepsy Awareness. People in countries around the world are invited to wear purple and host events in support of epilepsy awareness. "Pink Wednesday" is the International Day against Discrimination, Bullying, Homophobia and Transphobia in schools and communities. There is already an anti-bullying day but once a year is not enough. Pink Thursdays as an initiative which aims to serve as a reminder that bullying in all forms is unacceptable, whether in a school, in an organization or in our personal lives. Nobody is immune to bullying, any person can be affected, young or old, citizen or immigrant, high paying executive or front line worker. Our goal is to create greater knowledge of and access to resources for those who are experiencing or have been witness to any form of bullying. This colorful day is a Christian inspired awareness day when Christians will be remembered and prayed for and will be called to action to end religious persecution around the world. The Red Wednesday Campaign’s call is “Stand up for Faith and Freedom.” Red is the color of blood and martyrdom. Orange Thursday, also referred to as California Thursday, is a collaboration between the Center for Ecoliteracy and participating school districts to serve healthy, freshly prepared school meals featuring California-grown foods. October is Domestic Violence Awareness Month. Wearing purple on Fridays in October is to increase awareness of Domestic Violence. October is Breast Cancer Awareness month, an annual worldwide campaign involving thousands of organizations, to highlight the importance of breast cancer awareness, education and research. Friday, October 19 was this year’s “Wear It Pink” Day. "National Wear Red Day" is celebrated annually on the first Friday during the month of February. It is the day both men and women wear the color red to raise awareness of heart disease in women, the number one health problem of American women, and to show support for women's heart health. Red Friday, also a day for wearing red, is a way of demonstrating appreciation to our soldiers for their bravery and sacrifice. It is the same in Canada, where wearing red on Friday shows support for Canadian Troops. On Blue Saturday, wear Blue to honor fallen law enforcement officers. Your choice. Whatever you decide to do, enjoy your BLACK FRIDAY! "ON THE FIRST DAY OF CHRISTMAS…"
The song was first published in English in 1780. The twelve day of Christmas are those between Christmas [December 25] and the Epiphany on January 6, which marks the end of the Christmas season on the religious calendar. Some of the 1780 lyrics remain intact in the version we sing today, which is derived from a 1909 arrangement of traditional folk melody by English composer Frederic Austin, who added the five golden rings to the original. The original 1780 version with additions by Frederic Austin, the “four calling birds” are “four colly birds.” Colly – literally “coaly” – is the old English word meaning “soot-black.” By the mid-19th century, however, the word colly had largely fallen out of use, leaving several Victorian editions of "The Twelve Days of Christmas" to come up with their own replacements. “Colour’d birds” and even “curley birds” were used in some editions, while an exotic “four canary birds” were added to the lyrics of one version. The now-standard “four calling birds” first appeared in the early 1900s. If you want to get into all the variations, Wikipedia lists twenty different variations dating from 1780 to 1966. It is an amazing collection of critters and people, along with bell’s a-ringing and sprigs of juniper, participating in this multitude of verses. I started this pre-Thanksgiving blog with every intention of updating my more-or-less historic look at Thanksgiving and how it became a holiday. In the process I ran onto an old quote from Charlie Brown in the comic strip Peanuts. ​It not only made me stop and consider the specific message, but also a question I’ve contemplated on occasion in the past. Is there a technical difference between “thankful” (which we are supposed to be on Thanksgiving) and “grateful”? While they seem to mean the same thing, and people often use them interchangeably, the two words don’t feel the same. And I noticed Charles Schulz used the word “grateful” rather than “thankful”, even though the original comic strip related to Thanksgiving. When in doubt, go to the experts; my mother taught me to look up everything in the dictionary. So as not to favor one source over another, I looked the words up in three dictionaries. ● “Grateful” = "feeling or showing an appreciation for something done or received." In that respect, Thanksgiving is a holiday dedicated to being thankful. For these few days per year, most of us in the United States focus our thoughts on feelings of thankfulness for the wonderful things in our lives. There is certainly nothing wrong with that. It’s awesome. Live out your gratitude every day through the small things you do, including expression your feelings of gratefulness. I believe that is what the words of Charlie Brown (and Charles Schulz) mean. Besides being good for others, experts and studies tell us practicing gratefulness in our lives is good for us and the benefits can alter our lives. Unfortunately, human beings are not hardwired to be grateful. We have to work at it and practice a lot. ◄ GRATITUDE Practicing Gratitude Can Make You Happier" says it’s good for us in the following ways. ● Gratitude makes us feel more gratitude. While in a grateful mood, we will feel gratitude more frequently, when we do feel gratitude it will be more intense and held for longer, and we will feel gratitude for more things at the same time. In five words – gratitude triggers positive feedback loops. ● Gratitude makes us happier. ● Gratitude makes people like us. ​Outwardly showing gratitude makes us nicer, more trusting, more social, and more appreciative. As a result, it helps us make more friends and deepen existing relationships. We’re nicer to be around. ● G R A T I T U D E makes us healthier. ● Gratitude boosts your career. Gratitude makes you a more effective manager, helps you network, increases your decision making capabilities, your productivity, and helps you get mentors and protégés. As a result, gratitude helps you achieve your career goals, as well as making your workplace a more friendly and enjoyable place to be. ​● Gratitude strengthens our emotions and helps develop our personalities. ● Gratitude increase your energy levels. ​● Gratitude makes us more optimistic. Gratitude is strongly correlated with optimism. Optimism in turn makes us happier, improves our health, and has been shown to increase lifespan by as much as a few years. ● Gratitude makes us less self-centered. Some people spend way too much time thinking about themselves, and too little thinking about others. As compassion and gratitude practices develop, you may feel spontaneous urges to help others. ​Imagine a world where no one helps you. Despite your asking and pleading, no one helps you. Now imagine a world where many people help you all of the time for no other reason than that they like you. In which world do you think you would have more self-esteem? Gratitude helps to create a world like that. How does gratitude create a more supportive social dynamic? ● Gratitude makes our memories happier. Our memories are who we are, and they are not set in stone. Memories of events, people, everything we experience can change over time. We can remember things as being worse than they actually were, as being longer or shorter, as being funnier or sadder, people as being kinder or crueler, as being more or less interesting, etc. Experiencing gratitude in the present makes us more likely to remember positive memories. Also, it can mutate some of the neutral or even negative memories into positive ones. Spiritual transcendence is highly correlated with feelings of gratitude. That is – the more spiritual you are, the more likely you are to be grateful. This is for two reasons: 1) All major religions espouse gratitude as a virtue, and 2) Spirituality spontaneously gives rise to grateful behavior. The list goes on and on, but you get the idea. In fact, living our your gratitude is supposed to do just about everything from making you look better and more inclined to exercise to washing your underwear (well, almost that). Gratitude helps us realize what we have, and awareness of what we're grateful may reduce the tendency to want more all the time. Notice your everyday world from the viewpoint of gratitude. It’s astounding the good things we take for granted, and the not-so-good things we focus on. So be thankful on Thanksgiving for all the wonderful things in this world, and even some of the not-so-wonderful. Be grateful every day you live and in the way you live, and things will be better than ever. I've already blogged about African baboonery, and we're still in Africa. Now we're off to meet the baobab! No, it's not another kind of wild animal. It's a tree...but a very unique one. Among the millions of species of trees on the planet, there is nothing quite like the baobab. And my heroine, Harriet Ruby, has to spend the night in one with a baboon. Okay. So a tree is a tree is a tree. I know you didn't drop in for a botany lesson, but hear me out. It's not just a tree, but a sacred link to the past and an essential part of the cultures where it grows, a symbol of strength, wisdom, health, long life, and beauty. Of the eight species of the genus Adansonia -- You really needed to know that, right? -- six are native to Madagascar, one to the African and Arab peninsulas, and one to Australia. They can live to be thousands of years old, some say as long as 3,000 years or more, and have a peculiar, massive, bottle-shaped trunk and sparse foliage. The branches look like spread out like roots, hence the names "upside-down tree." A famous traveler and writer, Iban Battuta (born 1304 in Tangiers), was the first to record a description of a baobab tree. The African baobab begins as a single stem without branches and produces roots resembling giant sausages. During its lifetime, the roots of the tree send more stems in a ring which eventually fused, forming a cavity inside. Unlike most trees, the baobab doesn’t sprout more branches but grows new trunks, ultimately creating a large hollow tree. The Lembo baobab is composed of five fused stems, and there is evidence that a sixth had also once existed. The oldest part of the tree is 1,355 years old, and the youngest stem is only 900 years old. In the hundred or so years after the youngest stem began growing, the stems fused together, forming the false cavity, which itself reached its current size and stopped growing about 500 years ago. The Sunland Baobab in Limpopo, South Africa, stands 72-feet tall, and is estimated to be as old as 6,000 years old, one of the oldest trees on Earth. Measuring at 155 feet around the base of the trunk, it is hallow and the owners built a pub inside that held fifteen people. Sadly, this ancient tree succumbed to age. On 13 April, 2018, the owners, the Van Heerdens, posted this message. "We are sad to announce that our upside-down tree has toppled over this morning at 04:00. Never in our lives could we have imagined that this great giant that has stood sturdy all these years could break so tragically." They also wrote they felt "blessed to have been part of the process." Scientists who study the Baobab tree have indicated that “seven out of ten of the ancient Baobabs in Africa have collapsed in the last couple of years. The scientists who have studied this tree for over 10 years say there is nothing we could have done." The peoples who have been fortunate enough to live in proximity to the baobab, call it “The Tree of Life.” And rightfully so. Every part of the tree can be used, which is the primary reason for the name. Its fruit, bark, roots, and wood provide innumerable products used by the natives of Africa and Madagascar for thousands of years. Uses include food, red dye, Vitamin C, medicine, rope and strings for musical instruments. Canoes are carved from the wood. The trunks themselves provide shelter for people and animals, and they serve as water cisterns. The list goes on and on. The shell of the fruit, about the size of a coconut, feels velvety to the touch and weighs about 1.5 kilograms (3.3 lbs). It has an acidic, tart flavor described as "somewhere between grapefruit, pear, and vanilla." The dried fruit powder contains about 12% water and various nutrients, including carbohydrates, dietary fiber, antioxidants, vitamin C, calcium, magnesium, B vitamins, potassium and iron. The Baobabs are strange and somewhat mysterious in Africa, and tales about them–many about why they are “upside down”–have been handed down verbally from generation to generation. Griot are the Senegalese keepers of the oral tradition. They are singers who chant praises to families in times of celebration. The trade is one passed on from father to father, from generation to generation since as long as people can remember. In the past, each family had its own griot who they supported in exchange for recounting the family stories going back generations. Traditions hold that griot, because they had never worked the earth, couldn’t be buried in the ground. If they were, a severe drought would occur. Therefore, they were "buried" within the baobab. The first president of Senegal, President Senghor (1960-1980), passed a law outlawing burials within Baobab trees. The same year the law was passed, there was a severe drought. A very long time ago, when the earth was first created, the first baobab sprouted beside a small lake. As it grew taller it saw other trees, noting their colorful flowers, straight and handsome trunks, and large leaves. One day the wind died. leaving the water smooth as a mirror, and the tree finally got to see itself. The reflected image shocked it to its root hairs. Its own flowers lacked bright color, its leaves were tiny, it was grossly fat, and its bark resembled the wrinkled hide of an old elephant. In a strongly worded invocation to the creator, the baobab complained about the bad deal it had been given. This impertinence had no effect: Following a hasty reconsideration, the deity felt fully satisfied. Relishing the fact that some organisms were purposefully less than perfect, the creator demanded to know whether the baobab found the hippopotamus beautiful, or the hyena’s cry pleasant, and then retired in a huff behind the clouds. Back on earth the barrel-chested whiner neither stopped peering at its reflection nor raising its voice in protest. Finally, an exasperated creator returned from the sky, seized the ingrate by the trunk, yanked it from the ground, turned it over, and replanted it upside down. From that day forward, the baobab has been unable to see its reflection or make complaint. Instead, for thousands of years it has worked in silence, paying off its ancient transgression by doing good deeds for people. An interesting legend from Madagascar addresses one of the six species of baobab tree that can be found on the island. The Baobab Amoureux is a species where two Adansonia trees have twisted around each other as they have grown. “It is believed that the Baobab Amoureux came into being because of a tragic love story. Centuries ago a young man and a young woman lived in villages that were close to each other and, over time, the two fell in love and wanted to be together forever. However, both the young man and young woman were already betrothed to people from their own villages. Both refused to give up their dream of marrying and having a child, so they secretly asked the creator for help. This baobab above (Zimbabwe) shows the shape that generated the name upside-down tree. Most are small to moderate sized, but they can get huge around the trunks, which are mostly hollow, big enough to use for housing, chapels, barns, shops, bus shelters, post boxes, burial sites, wells, flush lavatories, and prisons. In Queensland, Australia, one served as the town prison. Most of the trunks I saw weren't anywhere near the girth of the tree in the photo, and some of the African baobab don't get very tall. Below is a photo I took a photo of a baobab near Victoria Falls. Using this as an example, it would be feasible for an athletic person like my heroine to be able to throw her backpack around a lower branch, "walk" up the trunk, and climb onto the branch. Hopefully, on the off chance anyone from Madagascar might read my novel, I apologize for my flight of fancy and ask that person to cut me some slack. I hadn't seen the ninety-foot–high baobab which grows in Madagascar. There are six different species of baobab tree, some of which are very different from their African neighbors. Take a look at the photos of the below of the Giant Madagascar Baobab, and you'll understand my apology. This is where the 90 to 100 feet in height kicks in. Below are Giant Madagascar Baobab and another variety called a bottle tree. They look otherworldly, don't they? One article likened them to something out of a Dr. Seuss book. Maybe Madagascar is going on my bucket list. Watch for the release of All For A Blast Of Hot Air in November. Travel with Harriet Ruby, Tour Director Extraordinaire, and her fiancé, Europol spy Will Talbot, as they travel in Zimbabwe and Botswana pursued by and in pursuit of – How'd you guess? – international terrorists. Find out if they finally get their HEA. You can set a novel in a place you've never been and pull it off, but it's better to have been there. Physical presence gives you a sense of how the location feels, tastes, and smells. You hear the background sounds, feel the rhythm and pace. These things are often hard to research. Even if you've never been to the location where your novel is set, thinks about those characteristics of place. The setting for my latest novel in the romantic suspense series "Tour Director Extraordinaire" is southern Africa. I traveled to South Africa, Botswana, Zimbabwe, and Zambia in 2008, and that trip inspired the novel, All For A Blast of Hot Air. This is the fifth and last of the series. While I was there, someone we met spoke of having taken a hot air balloon safari. About all I heard was how wonderful the experience had been — I'm not even sure where in Africa she'd been — but the comment struck a chord, and set the stage for the novel. ● The setting as an antagonist / introduces conflict, trouble, thwarts protagonist's plans. ​● The setting as an example / a setting that either assists or hinders the character in the particular scene. We didn't take a hot air balloon safari, but we did go on ground safaris. Unfortunately, there were so many amazing locations and activities in those four countries that just didn't fit into my book. I wanted to write about all of it. I find that unless I have a rough outline already when I visit the setting, I may or may not pay attention to the details which end up enriching the story. I've learned to be more astute about things which potentially could be woven into a story. The following experiences are only mentioned in passing in my novel, if at all, but they added to my sense of what southern Africa is like. Think about them and see if these minimal descriptions bring any ideas about settings to your mind. In what kind of book would any one of these setting be appropriate? These are sick or starving elephants that have been abandoned by the herd. This is unusual because elephants are very social and protective of their own. It has to be a severe situation for them to abandon one. When found, the elephants are brought back to health and used for tourist rides. The money earned goes into the upkeep of the animals. Young elephants might get reintroduced into a herd, but after spending so much time around humans, it's not often the herd will accept the outsider. After the ride you could buy a footprint of the elephant you rode. ​Walking with the Lions is part of the "ALERT" program which is intended to reintroduce lions into parts of Africa where the population has been reduced due to farmers killing them to protect their farms and livestock. A century ago, the lion population in all of Africa numbered about 200,000. Now the population is between 20,000 and 30,000. Again, the money earned for these tourists walks (which are actually part of training the lions) helps to fund the program. These falls are not the highest or widest in the world, but during the wet season it is the largest falling sheet of water in the world. The full width of the Zambezi River (5,604 feet – over one mile wide) plummets straight down for 354 feet in a single sheet. ​Part of the uniqueness of the falls is that there aren't any mountains or deep valleys as you would expect. Just flat land with a wide river…and then you see a billowy column of what looks like white smoke. It's actually the spray from the river plummeting into a deep vertical chasm caused by water erosion over thousands of years in the fracture zones. In the third photo, you can see the other eroded channels that zig-zag across the terrain where the Zambezi continues. My trip was during the dry season so the falls, impressive as they were, were sparse. The photo to the left shows the flow of water during a really wet season. A baboon actually made it into the novel as a secondary character. In person, they are bigger than I expected and can be very scary. This is Manny Balzac, a "character" in the novel All For A Blast of Hot Air. Actually, he's a Mandrill. In southern Africa, baboons run free like squirrels and coyotes. They're incredibly smart, can open most locks, and harass the tourists by breaking into cars and homes looking for food. The one below is in a golf cart at a golf course. They also steal the golf balls. The other photo is in a national park. We were warned at the lodge to be sure our balcony doors were locked with a special lock if we left the room. 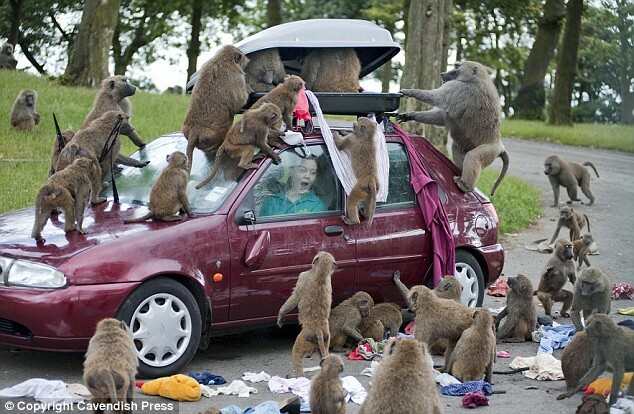 Baboons will come inside looking for food, and they don't mind breaking things. This photo is used by one of the African National Parks Services to warn tourists and campers about leaving food around. These are unusual trees that grow only in Africa and Madagascar. The branches look like spread out like roots, hence the names "upside-down tree". My heroine ends up spending the night in one of these trees with the Manny. Zebra pate, Mopani worms, and soup with crickets. Oops! That wasn't the way the soup was prepared. The cricket flew into the open-air restaurant at our very nice hotel in Zimbabwe and landed in my friend's soup...but it didn't have anywhere to land in the book. In some cases, with disastrous results. This part of the African trip definitely made it into the book with some interesting consequences when the hero and heroine make love. The example below shows the most predominant styles of hanging netting. Can you see why these features which don't exist everywhere can bring the flavor and uniqueness to the novel? Unless you have a reason to use a mosquito netting, you can't pull it out of the ceiling on top of you making love. P.S. Put a safari on your bucket list.